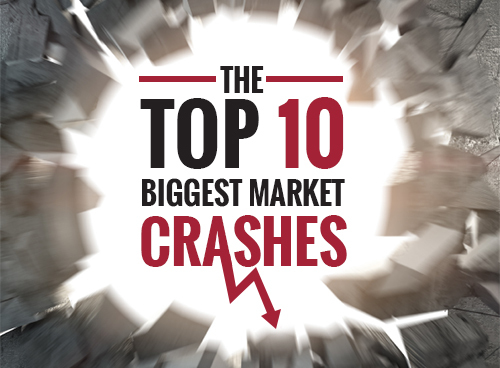 Finance Monthly explores the 10 biggest market crashes throughout history and their trigger factors. In 1593 tulips were first brought to The Netherlands from Turkey and quickly became widely sought after. After some time, tulips contracted a non-fatal tulip-specific mosaic virus, known as the ‘Tulip breaking virus’, which started giving the petals multicolour effects of flame-like streaks. The colour patterns came in a wide variety, which made the already popular flower even more exotic and unique. Tulips, which were already selling at a premium, grew more and more in popularity and attracted more and more bulb buyers. Prices, especially for bulbs with the virus, rose steadily and soon Dutch people began trading their land, life savings and any other assets they could liquidate to get their hands on more tulip bulbs. The craze got to a stage where the originally overpriced tulips saw a 20 fold increase in value in one month. The 1673 Tulip Mania is now known as the first recorded economic bubble. And as it goes in many speculative bubbles, some people decided to sell and crystallise their profits which resulted in a domino effect of lower and lower prices. Everyone was trying to sell their bulbs, but no one was interested in buying them anymore. The prices were progressively plummeting and everyone was selling despite the losses. The Dutch Government tried to step in and offered to honour contracts at 10% of the face value, which only resulted in the market diving even lower. No one emerged undamaged from the crash and even the people who got out early were impacted by the depression that followed the Tulip Craze. Another speculation-fuelled fever occurred in Europe a few decades after the Tulip Mania – this time in the British Empire. The bubble centred around the fortunes of the South Sea Company, whose purpose was to supply 4,800 slaves per year for 30 years to the Spanish plantations in Central and Southern America. Britain had secured the rights to provide Spanish America with slaves at the Treaty of Utrecht in 1713 and the South Sea Company paid the British Government £9,500,000 for the contract, assuming that it could open the door to trading with South America and that the profits from slave trading would be huge. This was met with excitement from investors and resulted in an impressive boom in South Sea stock – the company’s shares rose from 128 1/2 in January 1720 to over 1,000 in August. However, by September the market had crumbled and by December shares were down to 124. And the reason behind the bubble burst? Speculators paid inflated prices for the stock, which eventually led to South Sea’s dramatic collapse. The economy was damaged and a large number of investors were completely ruined, but a complete crash was avoided due to the British Empire’s prominent economic position and the government’s successful attempts to stabilise the financial industry. The Vienna Stock Exchange Crash of May 1873, triggered by uncontrolled speculation, caused a massive fall in the value of shares and panic selling. The National Bank was not able to step in and provide support because it didn’t have enough reserves available. The crash put an end to economic growth in the Monarchy, affected the wealth of bankers and some members of the imperial court and confidants of the Emperor, as well as the imperial family itself. It also led to a drop in the number of the Vienna World Exhibition visitors – a large world exposition that was held between May and October 1873 in the Austria-Hungarian capital. Later on, the crash gradually affected the whole of Europe. On 29th October 1929, now known as Black Tuesday, share prices on the New York Stock Exchange collapsed – an event that was not the sole cause of the Great Depression in the 1930s, but something that definitely contributed to it, accelerating the global economic collapse that followed after the historic day. During the 1920s, The US stock market saw rapid expansion, which reached its peak in August 1929 after a lot of speculation. By that time, production had declined and unemployment had risen, which had left stocks in great excess of their real value. On top of this, wages were low, agriculture was struggling and there was proliferation of debt, as well as an excess of large bank loans that couldn’t be liquidated. In September and early October, stock prices began to slowly drop. On 21st October panic selling began and culminated on 24th, 28th and the fatal 29th October, when stock prices fully collapsed and a record of 16,410,030 shares were traded on NYSE in one day. Financial giants such as William C. Durant and members of the Rockefeller family attempted to stabilise the market by buying large quantities of stocks to demonstrate their confidence in the market, but this didn’t stop the rapid decrease in prices. Because the stock tickers couldn’t handle the mammoth volume of trading, they didn’t stop running until about 7:45 pm. During the day, the market had lost $14 billion. The crash remains to this day the biggest and most significant crash in financial market history, signalling the start of the 12-year Great Depression that affected the Western world. On 19th October 1987, stock markets around the world suffered one of their worst days in history, known today as Black Monday. Following a long-running rally, the crash began in Asia, intensified in London and culminated with the Dow Jones Industrial Average down a 22.6% for the day – the worst day in the Dow’ history, in percentage terms. Black Monday is remembered as the first crash of the modern financial system because it was exacerbated by new-fangled computerised trading. The theories behind the reasons for the crash vary from a slowdown in the US economy, a drop in oil prices and escalating tensions between the US and Iran. By the end of the month, stock markets had dropped in Hong Kong (45.5%), Australia (41.8%), Spain (31%), the United Kingdom (26.45%), the United States (22.68%) and Canada (22.5%). Unlike the 1929 market crash however, Black Monday didn’t result in an economic recession. Following a long-running rally, the crash began in Asia, intensified in London and culminated with the Dow Jones Industrial Average down a 22.6% for the day – the worst day in the Dow’ history, in percentage terms. The Asian crisis of 1998 hit a number of emerging economies in Asia, but also countries such as Russia and Brazil, having an overall impact on the global economy. The Asian crisis began in Thailand in 1997 when foreign investors lost confidence and were concerned that the country’s debt was increasing too rapidly. The crisis in Thailand gradually spread to other countries in Asia, with Indonesia, South Korea, Hong Kong, Laos, Malaysia and the Philippines being affected the most. The loss of confidence affected those countries’ currencies – in the first six months, the Indonesian rupiah’s value was down by 80%, the Thai baht – by over 50%, the South Korean won – by nearly 50% and the Malaysian ringgit – by 45%. In the 12 months of the crisis, the economies that were most affected saw a drop in capital inflows of more than $100 billion. In the second half of the 1990s, the commercialisation of the Internet excited and inspired many business ideas and hopes for the future of online commerce. More and more internet-based companies (‘dotcoms’) were launched and investors assumed that every company that operates online is going to one day become very profitable. Which unfortunately wasn’t the case – even businesses that were successful were extremely overvalued. As long as a company had the ‘.com’ suffix after its name, venture capitalists would recklessly invest in it, fully failing to consider traditional fundamentals. The bubble that formed was fuelled by overconfidence in the market, speculation, cheap money and easy capital. On 10th March 2000, the NASDAQ index peaked at 5,048.62. Despite the market’s peak however, a few big high-tech companies, such as Dell and Cisco, placed huge sell orders on their stocks, which triggered panic selling among investors. The stock market lost 10% of its value, investment capital began to melt away, and many dotcom companies went out of business in the next few weeks. Within a few months, even internet companies that had reached market capitalisation in the hundreds of millions of dollars became worthless. By 2002, the Dotcom crash cost investors a whopping $5 trillion. As long as a company had the ‘.com’ suffix after its name, venture capitalists would recklessly invest in it, fully failing to consider traditional fundamentals. This market crash needs no introduction – we all must remember how ten years ago Wall Street banks’ high-risk trading practices nearly resulted in a collapse of the US economy. Considered to be the worst economic disaster since the Great Depression, the 2008 global financial crisis was fed by deregulation in the financial industry which allowed banks to engage in hedge fund trading with derivatives. To support the profitable sale of these derivatives, banks then demanded more mortgages and created interest-only loans that subprime borrowers were able to afford. As the interest rates on these new mortgages reset, the Federal Reserve upped the fed funds rates. Supply outplaced demand and housing prices began to decrease, which made things difficult for homeowners who couldn’t meet their mortgage loan obligations, but also couldn’t sell their house. The derivatives plummeted in value and banks stopped lending to each other. Lehman Brothers filed for bankruptcy on 15th September 2008. Merrill Lynch, AIG, HBOS, Royal Bank of Scotland, Bradford & Bingley, Fortis, Hypo Real Estate, and Alliance & Leicester which were all expected to follow however were saved by bailouts paid by national governments. Despite this, stock markets across the globe were falling. And we all remember what followed… The bursting of the US housing bubble and Lehman Brothers’ collapse nearly crushed the world’s financial system and resulted in a damaged house market, business failures and a wounded global economy. On 6th May 2010, the US stock market underwent a crash that lasted approximately 36 minutes, but managed to wipe billions of dollars off the share prices of big US companies. The decrease occurred at a speed never seen before, but ended up having a very minimal impact on the American economy. With the opening of the market on 6th May 2010, there were general market concerns related to the Greek debt crisis and the UK general election. This led to the beginning of the flash crash at 2:30pm – Dow Jones had declined by more than 300 points, while the S&P 500 and NASDAQ composite were affected too. In the next five minutes, Dow Jones had dropped a further 600 points, reaching a loss of nearly 1000 points for the day. By 3:07pm things were looking better and the market had regained much of the decrease and only closed at 3% lower than it opened. The potential reasons behind the crash vary from ‘fat-fingered’ trading (a keyboard error in technical trading) to an illegal cyberattack. However, a joint report by the US Securities and Exchange Commission (SEC) and the Commodity Futures Trading Commission (CFTC) stated that the extreme price movement could have been caused by the combination of prevailing market conditions and the large automated sell order. As some securities lost 99% of their value in a few minutes, this was one of the most impressive stock market crashes in modern history. After a few years of being viewed in an increasingly favourable light, China’s Stock Market burst on 12th June 2015 and fell again on 27th July and 24th August 2015. Despite the Chinese Government attempt to stabilise the market, additional drops occurred on 4th and 7th January and 14th June 2016. Chaotic panic selling in July 2015 wiped more than $3 trillion off the value of mainland shares in just three weeks, as fear of complete market seizure and systemic financial risks grew across the country. Surprise devaluation of the Chinese yuan on 11th August and a weakening outlook for Chinese growth are believed to have been the causes for the crash that also put pressure on other emerging economies.